Mwnt Beach01545 570200work BeachMwnt is a haven for wildlife, one of the best places in Ceredigion to spot dolphins and always popular for days out on the beach. On beautiful sunny days families flock to Mwnt to enjoy this hidden cove’s golden sand and rolling waves. Located about 4.5 miles north of Cardigan town centre on the Mid Wales coast, you’ll drive down country lines to be presented with dramatic views over Cardigan Bay upon arrival. To reach the beach there is a series of steps leading down to the sheltered sandy bay. You can also reach the beach by walking the local stretches of Wales’ Coastal Path. 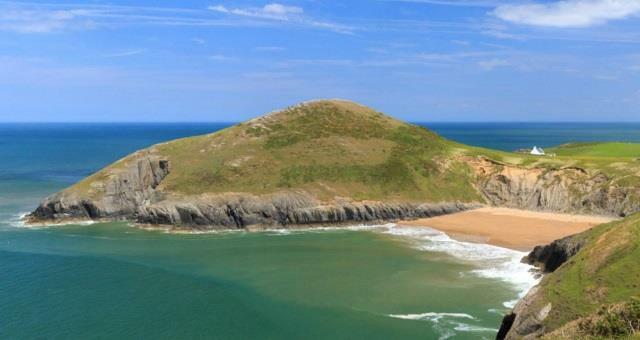 Mwnt is named after the conical hill (Foel y Mwnt) that rises above this popular beach and when visiting, a walk to the top of Foel y Mwnt is a must, take in the panoramic views over Cardigan Bay. If you’re lucky you will catch a glimpse of the mountains of Snowdonia in the distance and dolphins can often be seen playing in the bay, with Mwnt locally recognised as one of the best places to regularly spot them. Mwnt is an ancient holy site and it's picturesque and startlingly simple Church of the Holy Cross (Eglwys y Grog) dates from the 14th century when it served as a sailors' chapel of ease. It features a 12th or 13th century font made of Preseli stone when the church was a welcome refuge for medieval pilgrims enroute to St David's, Strata Florida or Bardsey in North Wales. In 1155 invaders from Flanders unsuccessfully made a raid on Mwnt in a bloody event commemorated today as Mwnt Red Sunday (Sul y Coch y Mwnt). On site facilities include the National Trust car park, toilets and a kiosk selling ice creams and all those little essentials you need to enjoy your day on the beach. Dogs not allowed May to end September and swimming and body boarding are popular pastimes. Awards include Green Coast and Seaside Award beach and in 2011, the Daily Mail placed Mwnt beach at the very top of its list of "Europe's top ten loveliest, hidden beaches" and in 2012 it topped Country Life's list of UK picnic sites. Mwnt is a haven for wildlife, one of the best places in Ceredigion to spot dolphins and always popular for days out on the beach. 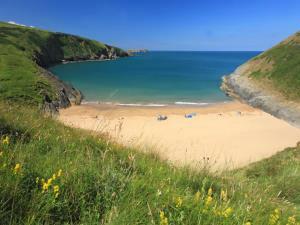 On beautiful sunny days families flock to Mwnt to enjoy this hidden cove’s golden sand and rolling waves. Take the B4548 Gwbert road from north of Cardigan town centre and turn right where signed for Mwnt.